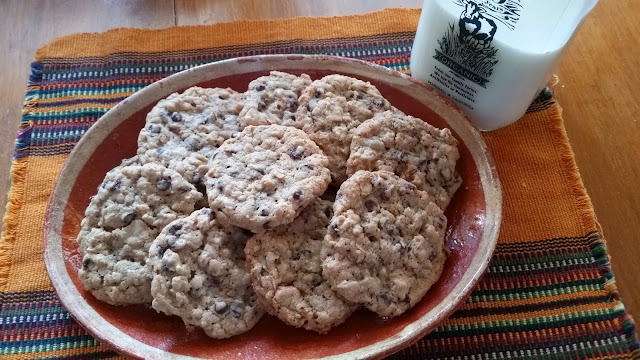 Adapted from the stickiest page of one of my oldest and dearest cookbooks, The Frog Commissary Cookbook by Steven Poses, I've been making these for over twenty years. The recipe is very easy to halve if you want to make a smaller batch, or you can freeze the dough and bake a little at a time over a few weeks. 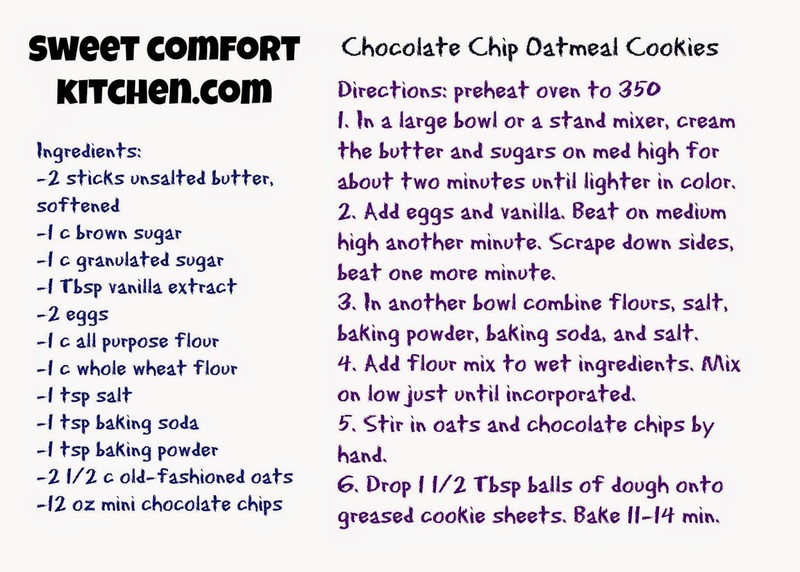 (Directions for freezing, more pics and a printable recipe card below). 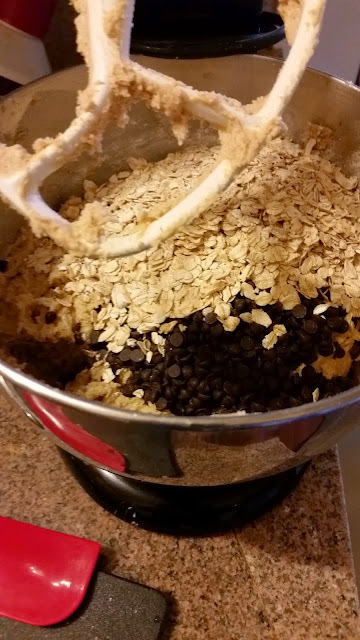 It's best to get them together before you start, rather than assuming you have everything and ending up running out to the 24 hour market halfway through mixing, or guesstimating how much molasses to add to white sugar to make brown. Or so I've heard. 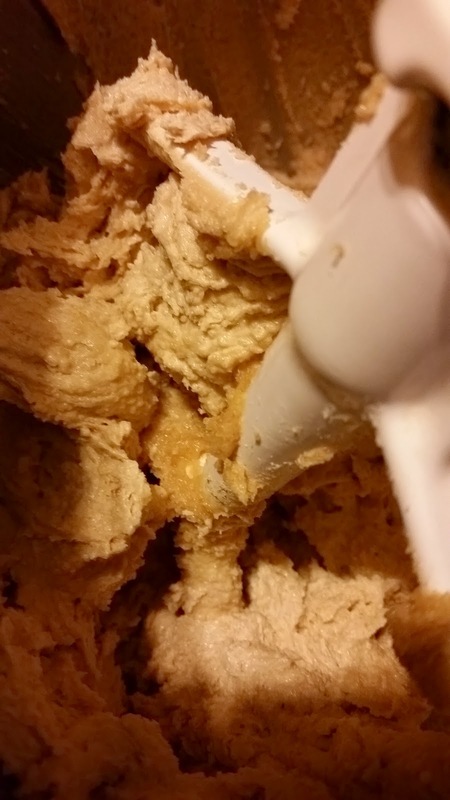 2 sticks unsalted butter, softened. (As I mentioned with the madeleines, it's ok if you forgot. Just cream longer). 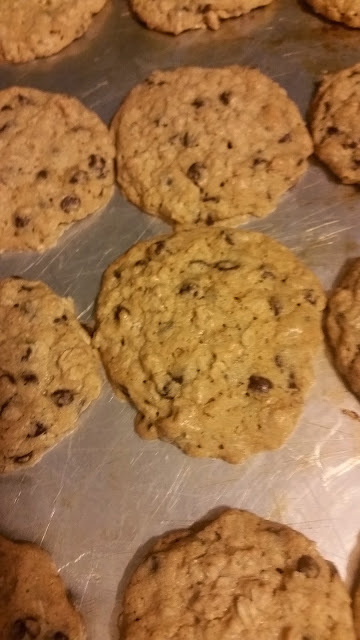 1 cup white whole wheat flour (you can substitute a second cup of AP or regular whole wheat if you don't have this). 12 oz mini chocolate chips (this is usually the amount in one bag, but they've been making smaller bags lately). I like mini chips for even chocolate distribution in every bite. 1. 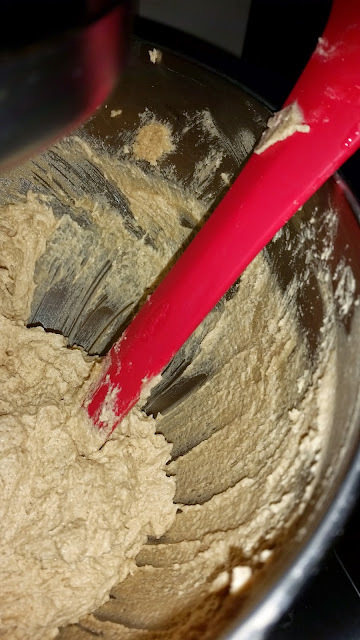 In a large bowl or the bowl of a stand mixer, cream the butter and sugars on medium high speed for about two minutes. Some say it's not creamed until you can't feel the sugar crystals anymore, but I don't have that kind of patience. It's creamed when the mixture lightens in color a bit, like you can see in the contrast in colors in the third photo. 2. 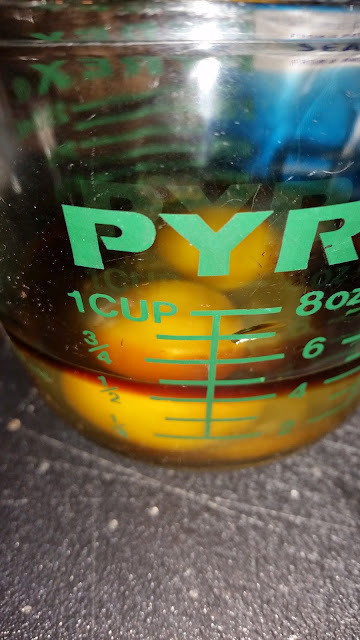 Crack the eggs into a clear container, then add vanilla and put into the butter mixture. Beat on medium high another minute, stop to scrape down the sides of the bowl and stir up the bottom with a rubber or silicone scraper, then beat one minute more. 3. 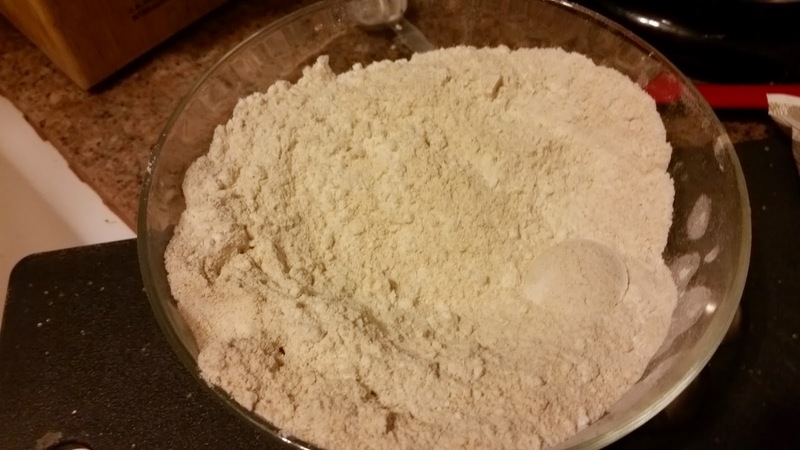 In a medium bowl combine the flours, salt, baking powder and baking soda. 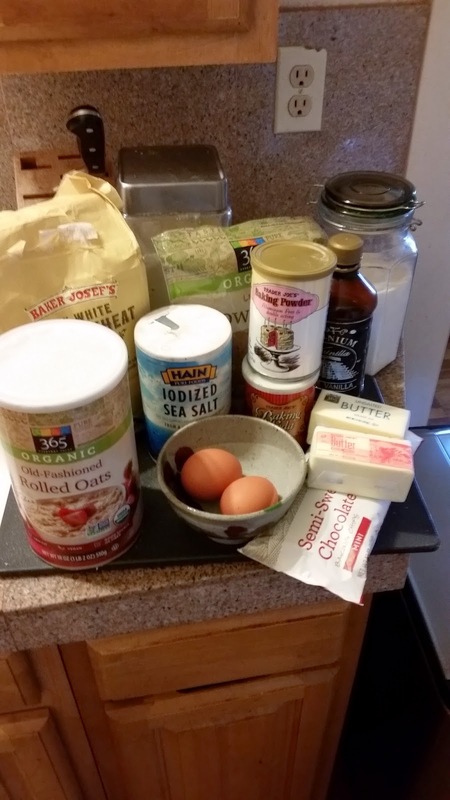 Whisking them together helps make sure there aren't any little clumps of baking soda in your cookies. 4. 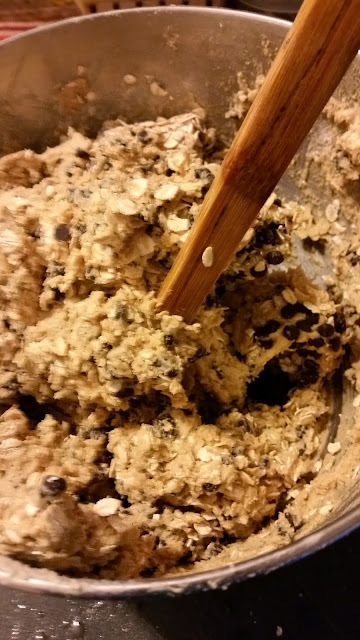 Add the flour mix to the wet ingredients and mix on low just until incorporated, stopping to scrape down the sides of the bowl halfway through again. Be careful not to overmix - being a tough cookie is good. Eating a tough cookie, not so much. 5. Add the oats and chocolate chips to the dough, get out a good old fashioned wooden spoon, and stir them in by hand. Make sure to stir up from the bottom for even distribution. 6. Using a small scoop or a spoon, drop 12 to 16 1 1/2 Tbsp rounds of dough onto a greased cookie sheet. Bake at 350 for 11-14 minutes, turning the pans around halfway through fire even browning. If you like them on the soft side like I do, pull them out when the outer edges are -just- turning golden and the centers don't look very wet. If you like them crispier, wait until they're golden brown about halfway from the outside. 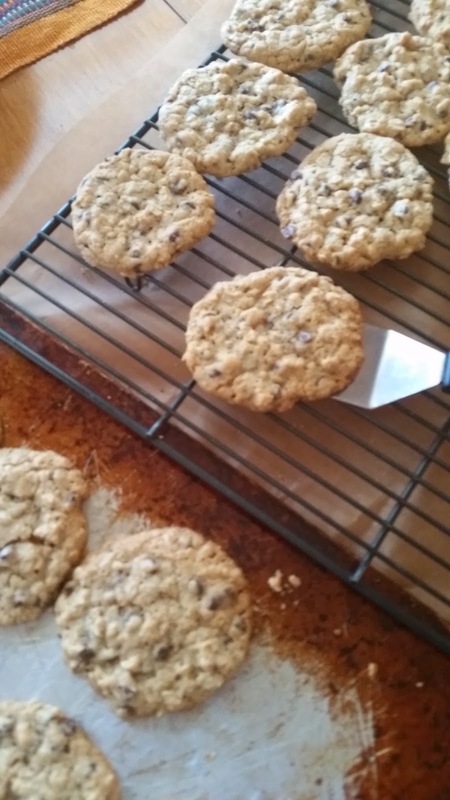 Let cool air five minutes on the sheets before using a metal spatula to transfer them to cooling racks. When cool, put in one big airtight container or several small ones to share with friends, neighbors, yoga teachers, whoever will enjoy them! Repeat step 6 until all the cookies are baked, or roll the remaining dough into logs, wrap the logs in plastic wrap and foil, and place in the freezer for up to three weeks. 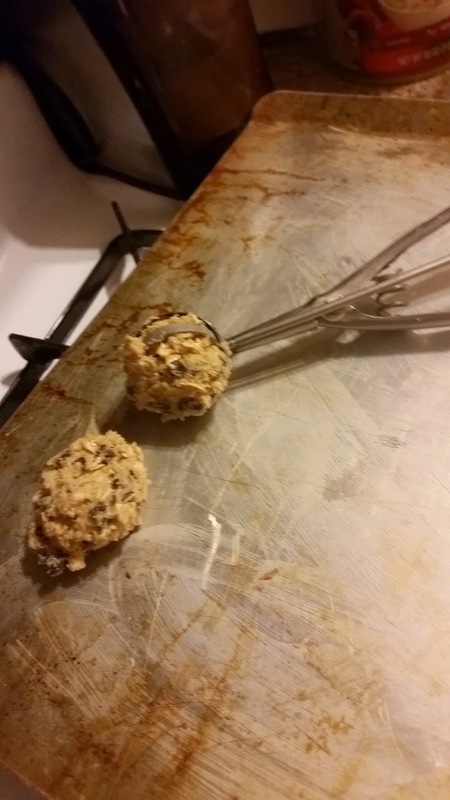 Slice off a couple of cookies at a time to bake when you want some, or slice and bake the rest all at once to share. 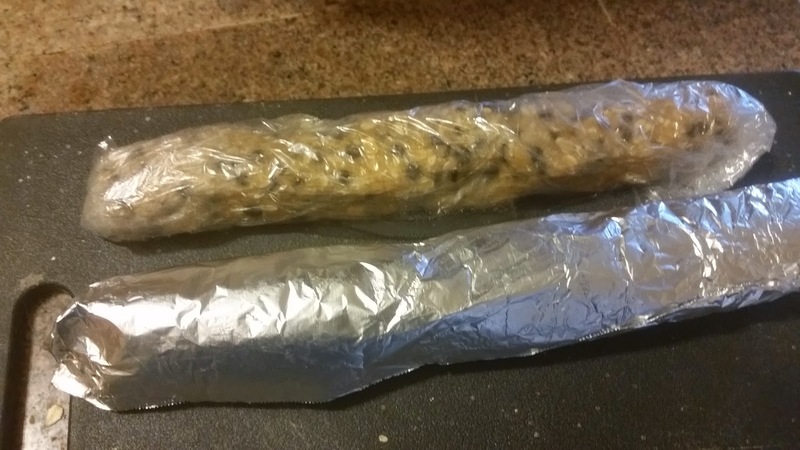 Bake directly from frozen - don't defrost the dough, just add a couple of minutes to the baking time. Note the cracked outlet plate where I tilt up the stand mixer and it hits the wall...oops!